Warrant (commission), signed by 'Arden. ', 'Charles Small Pybus.' and 'Chs. Middleton' as Lords of the Admiralty, and 'Php Stephens' as Secretary, appointing Paterson 'Captain of His Majesty's Ship the Ariadne'. On one side of a piece of vellum, dimensions 27 x 32 cm. Neatly folded to make eight rectangles. 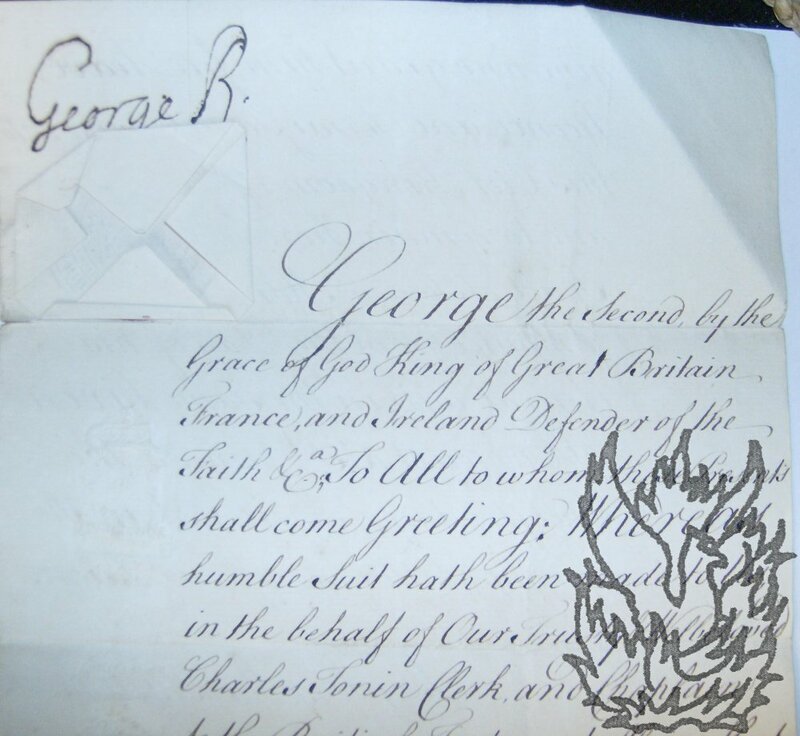 Red wax seal under paper in top left-hand corner, embossed with the Admiralty anchor. One blue 2s 6d stamp in left-hand margin. Small paper stamp on the reverse, which is docketed 'Ariadne | Capt. Paterson | Admty Conf Comm | 20 Jany 1794'. Text entirely legible on lightly discoloured vellum. The body of the document is printed over fifteen lines, with the specific information added in manuscript. Autograph Note Signed ('Robert Stopford') [to the Rev. Charles William Tonyn (d.1805) of Radnage, Bucks]. 12mo: 1 p. Five lines. Good, on lightly aged paper, with one minor water stain affecting a couple of letters of one word. Reads 'The Adm[ira]lt[ie]s order for you son's reception as Vol[untee]r 1st. Class in the Victory is arrived, & he may join as soon as convenient'. Docketed by Tonyn on reverse '3d. June 1828 |Sir Robt. Stopford Commr. in Chief Porstmo. respecting my son George'. After Trafalgar the Victory was moored in Portsmouth Harbour off Gosport and used as a depot ship. Original manuscript, in a variety of eighteenth-century hands, containing twelve army lists. Giving ranks of regiments, names of officers, dates of commission, pay, expenses, and other information. Apparently written between c.1718 and c.1756. Stitched 4to notebook, in original brown calf half-binding, with grey paper boards. 71 pp of text, with a further 19 pp blank, across 45 leaves of watermarked laid paper. Leaf dimensions roughly 19 x 15 cm. In good condition: internally clean and tight, on lightly aged paper. In worn boards. Ruled with red lines. Neatly written and entirely legible. Warrant (commission), signed by 'Sandwich', 'Bamber Gascoyne' and 'Greville' as Lords of the Admiralty, and 'Php Stephens' as Secretary, appointing Paterson 'Second Lieutenant of His Majesty's Ship the Formidable'. One one side of a piece of vellum, dimensions 28.5 x 33 cm. Neatly folded to make eight rectangles. 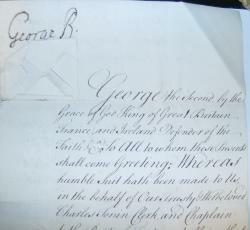 Red wax seal under paper in top left-hand corner, embossed with the Admiralty anchor. Two blue 2s 6d stamps in left-hand margin. Small paper stamp on reverse. Text entirely legible on lightly discoloured vellum, with one small hole (not affecting legibility of text) caused by wear to a fold. The body of the document is printed over fifteen lines, with the specific information added in manuscript. Two Autograph Letters Signed (both 'G D Yeats') to his sister Jane Ellen Paterson, wife of Admiral C. W. Paterson. Letter One: 18 July 1823; Tunbridge Wells. Letter Two: 3 November 1823; 17 Queen's Place, Mayfair. Both items clear and entire: good on lightly aged paper. Both addressed, with postmarks, to 'Mrs. Admiral Paterson, East Cosham Cottage, near Portsmouth.' Letter One, to 'My dear Ellen' (4to, 8 pp). Long letter, leaving his sister 'to judge as a reasonable Being whether I do not do every thing that can possibly be expected from me'. He is at present in debt to the tune of £460. Letter Two, to 'My dear Sister' (4to, 4 pp). Another letter dealing with the financial matters of the family. Docketed 'Dr. Yeats most strongly desiring his Sister Mrs.